These RV garage plans are great for protecting your motor home or recreational vehicle from prolonged exposure to the weather. Each has an efficency apartment in the attic and three additional bays for car or boat. 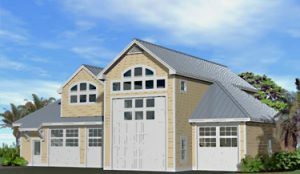 This large RV Garage was designed to complement the Grand Island Cottage. It has (3) high bays for car or boat plus a tall drive-thru RV bay to accomodate up to a 45′ long recreational vehicle. An efficiency apartment is located on the attic level. This design “un-boxes” the box and provides a pleasantly massed cottage structure to blend with the main dwelling. The 39′ RV Garage plan provides (3) parking bays for regular vehicles and a drive-thru RV Garage. The efficiency apartment provides ample living space and opens to a balcony to take in the fresh air. 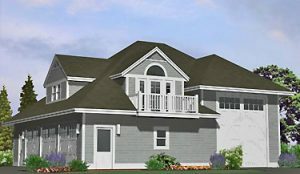 Architectural features blend with the Shelter Cottage or Island Cottage.